"This is a confident, noble male with a strong head,complete dentition, scissors bite, and dark almond eyes, rich pigment and a correct coat. He is a dog of normal size and proportions, substantial strong bones, well developed musculature. He has a firm, straight back, with a somewhat steep croup. He stands correctly in front and rear, with good pasterns and feet. Very good rear ligaments, correct single tracking, tight elbows with excellent front reach and rear drive. 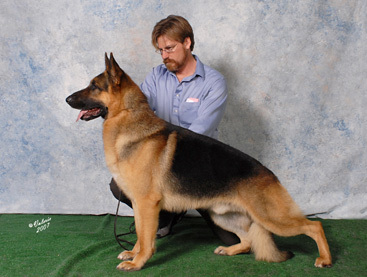 A short coupled, beautifully balanced young dog presented to perfection by Patty Breault Comeau."